Free instrument tuition on instruments such as: Guitar, Ukulele, and Djembe. This is primarily aimed at young kids and also people who don't have easy access to musical tuition. This will be a great opportunity for people to try their hand at something fun and different in a relaxed, friendly environment. Immediately become accustomed to the basics. Learn some songs, have loads of fun! Receive an introduction to an instrument of choice. This is a great idea because it gives young people the opportunity to discover what could be a lifetime passion free of charge. It is also a great idea because it enables people who may not usually have easy access to musical tuition to seize an opportunity to acquire some new skills and most of all, have some fun! I will ensure that the sessions are delivered in a relaxed, friendly manner in order to make everyone feel comfortable. I will run group age group sessions (5-10 yrs, 11-16 yrs, 16 and over). I will run this project at The Bunker, Sunderland. I can guarantee lots of fun for all who attend and that everyone will receive a worthwhile experience! Hi! My name is Thomas Dingwall. I work as a young Music Tutor at a rehearsal/recording studio in the heart of Sunderland City Centre. I have ran a plethora of various music workshops to people of all different backgrounds throughout my time here at The Bunker. I have so far developed a well-rounded portfolio of teaching experience as I have taught music in places such as colleges and community centres, as well as running regular workshops at The Bunker itself on a weekly basis. 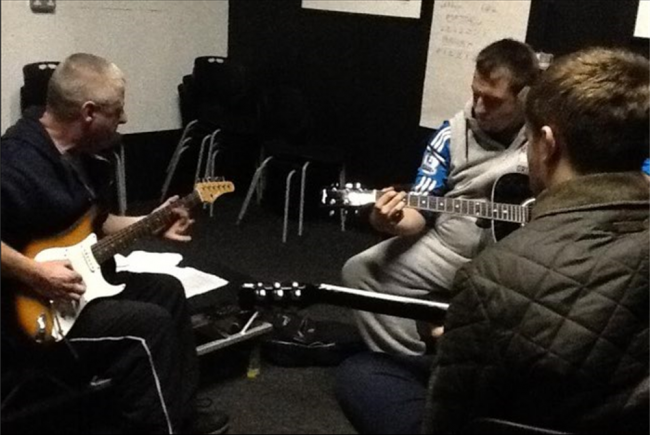 I run weekly guitar workshops twice a week to people of all abilities and ages. I would like to propose the idea of providing free music workshops that are primarily aimed towards people who don't necessarily have the easiest access to things such as instrument tuition. However, this can still appeal to anyone, regardless general accessibility. I just think it would be nice to give people who may not have the luxury of paying for weekly lessons a chance to attend some sessions that are free of charge. I can teach instruments such as: guitar, ukulele, and djembe. I would particularly like to focus on the idea of running ukulele sessions as I think this would appeal massively to a lot of people as it is a fun, easy-to-learn instrument! I have come to realise that learning the guitar can soemtimes be a demoralising experience for certain beginners if they don't see progress straight away. The ukulele is a very similar instrument, however it's a lot easier to learn and it can make learning the guitar process far easier in the future! I believe learning the ukulele would particularly appeal to younger people which I believe is a good thing as an early love of music will start to develop in them. I am very eager to get this project up and running straight away!